Rural countryside meets urban city styling with this Lancaster Table & Seating antique walnut solid wood live edge dining height table with 2 chairs. Coming with an attractive table top, compatible dining height base, and 2 matching side chairs, this set provides you with everything you need to set up and complete the look of your dining area. It's sure to add a rustic element with contemporary flair to your restaurant, bistro, or bar! 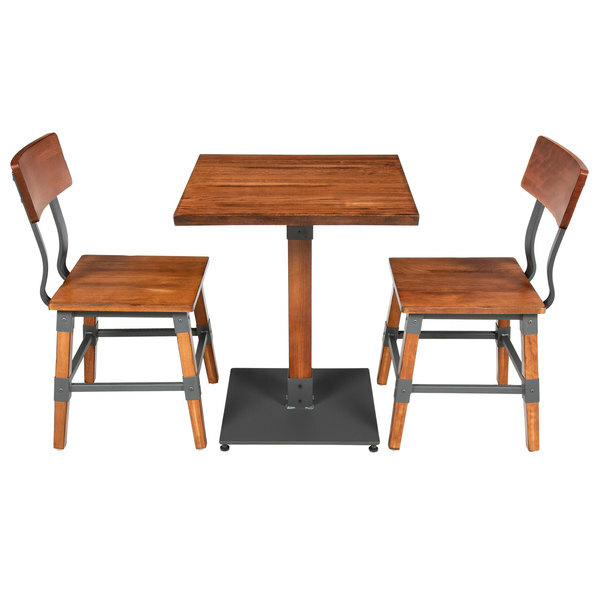 Thanks to its solid beech wood construction, the table top is sturdy enough to handle the wear and tear of everyday use in your restaurant. Its underside includes v-shaped metal braces that prevent the wood from warping, ensuring long-lasting service. While its shape offers guests ample room and a sturdy surface to enjoy their meals, its slightly rough edge and natural, distinctive woodgrain pattern creates a rustic appearance. The eye-catching table top is accented and supported by the included table base. It features a matching solid wood post with a metal base plate and spider attachment. While the wide, square base plate helps to prevent the table from wobbling, the 200 lb. weight capacity guarantees it will stand up to heavy meals, dinnerware, and decor. Combining a modern, square seat with a curved, rectangular back that cradles the spine for comfort, each chair provides patrons with a way to relax after a long day. The seats, backs, and legs are made of solid wood with an antique walnut stain, creating a captivating display and making the chairs easy to wipe down in between guests. The dark gray metal frames ensure a stable foundation, and the feet are capped with plastic glides to protect floors and keep unwanted noise to a minimum. Each chair has a 300 lb. weight capacity to suit most patrons. Plus, the entire set comes unassembled to save you on shipping costs. This Lancaster Table & Seating dining table and chair set meshes the warm, natural look of wood with rugged, metal components for a vintage yet trendy, industrialized appearance that your guests are sure to love!